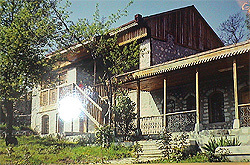 U.Hajibeyov's House-museum in Shusha was founded in 1959. This building Uzeyir was born and grown up, became the sacrosanct place for his creation followers. Tourists coming to Shusha from all quarters of the world were greatly impressed of attending the museum. There were exhibited furnishings of the Hajibeyovs, Uzeyir's personal articles, photographs, books, as well as the ones devoted to him and presented to the museum. Every year his birth dates, as well as jubilees were widely celebrated at national level. Heydar Aliyev, the public leader of our people, repeatedly visited this museum and highly appreciated its activity. In 1985 UNESCO at the international level celebrated Uzeyir Hajibeyov's 100-year jubilee. Fame representatives invited from many countries of the world, visited Hajibeyov's House-museum in Shusha, where big jubilees were celebrated. On May 8, 1992 Armenian invaders occupied Shusha after what U.Hajibeyov's museum ceased its activity. Due to courage and stableness of Nasiba Ali gizi, the director of Hajibeyov's House museum in Shusha, and Zahid Abbasov, the Head of Culture department in Shusha, museum artifacts were saved from the enemy and brought to Baku. At present they are kept in funds of U. Hajibeyov's House museum in Baku. CCCCC brought from Shusha are the follow: Uzeyirbey's personal articles - the cap he wore in childhood, his suit, spectacles, the coat, the violin he played in Gory seminary, writing furnishings, the inkpot, the personal album, photographs, his mother Shirinbeyim khanum's wedding dress, books with autographs devoted to U. Hajibeyov and presented to the museum. The most valuable thing among artifacts is the bunch of ground taken from the House- museum yard under the pear tree loved by the composer and brought from Shusha.